Home / Stock Picks / Stocks to Buy / Is McDonald’s Stock a Buy Before Earnings? Is McDonald’s Stock a Buy Before Earnings? Quick service restaurant giant McDonald’s (NYSE:MCD) has held up well during the recent market sell-off. While the S&P 500 is 6% off recent highs, MCD stock is less than 2% off recent highs. Granted, some of that is because stock in MCD dropped big earlier in the year and hasn’t fully recovered. But, another part of it is that investors see McDonald’s as a defensive play amid recent market turbulence given the company’s operational stability. That thesis will be put to the test on Tuesday morning when the MCD earnings report arrives. McDonald’s is set to report third-quarter numbers before the bell on Tuesday. If those numbers are good, MCD stock will continue to ride out broader market turmoil and grind higher. If those numbers are bad, though, the stock could fall by quite a bit, considering the stock has been an out-performer recently. What will McDonald’s Q3 numbers look like? And where will McDonald’s stock go after the report? I think those numbers will be pretty good, and that MCD stock will rally in response. Secular trends remain favorable for McDonald’s, and the company has continued to push forward on initiatives that have worked wonders over the past several quarters. Meanwhile, MCD stock trades at a reasonable and normal valuation level that lends itself to a pop in the event of strong numbers. Overall, I like McDonald’s stock here. Earnings should be good. But, more importantly, stock in McDonald’s is a long-term winner thanks to its big moat and substantial stability. That makes the stock a good addition to any portfolio at this point in time. The long-term thesis on McDonald’s is pretty simple: MCD stock is a buy because the company dominates the quick service restaurant industry where it matters most — price and convenience — and has shown a unique ability to adapt to dynamic consumer behavior in order to remain relevant. When it comes to fast food, there are three things that matter: price, convenience and product. Product takes a backseat to price and convenience. And, when it comes to price and convenience, no one challenges McDonald’s. Not only does McDonald’s offer some of the best prices across the board in the entire fast food world, but service is also quick and there always seems to be a McDonald’s that is relatively close. These two things have been true for several years and even decades, and remain true today. As such, McDonald’s dominating on price and convenience is a secular trend. The other thing that matters in fast food is product. For a while, McDonald’s product was stale. Multiple documentaries cast a light on how just unhealthy traditional fast food was, and consumers started to adopt a more health-conscious attitude about what they put into their bodies. This mindset shift made McDonald’s frozen food antiquated. But, McDonald’s has since adjusted. Over the past several quarters, the company has entirely revamped its menu to be healthier and fresher. They’ve added new options, and upgraded old ones, all while maintaining industry-wide low prices. The result? Dramatically improved traffic and sales trends. In other words, McDonald’s has forever dominated in the two areas that matter most in fast food. Recently, they’ve shown an ability to dominate in the third area, too. As a result, McDonald’s now dominates everywhere that matters in fast food, and that makes MCD stock a solid long-term investment. McDonald’s stock looks good in the near-term, too. Third-quarter numbers should be quite good. Although the company has been pressured by rising wages and some worker protests over the past several months, the bigger picture here is that the entire restaurant industry is picking up steam. In the third quarter of 2018, the restaurant industry posted its best traffic and sales growth in three years. Considering McDonald’s is the face of the restaurant industry, it is likely that the company benefited from this macro tailwind. Meanwhile, McDonald’s has continued to execute on key operational changes that have powered improved results over the past several quarters. Namely, the company continues to broaden its menu (for example, cold brew coffee is now being offered at select locations) and improve product quality (the company recently vowed to remove artificial preservatives from its burgers). Overall, then, the macro- and micro-pictures are both positive for McDonald’s. That leads me to believe Q3 numbers should be quite good. Good numbers should spark a rally in MCD stock. The stock trades at 20X forward earnings with a 2.4% dividend yield, so valuation is reasonable and only slightly above historical standards. Meanwhile, this stock is clearly being viewed as a safe-haven amid recent market volatility. Thus, if the numbers are good, you could see more investors buy into this safe-haven thesis, and MCD stock could shoot higher as a result. The bottom line here is very simple. McDonald’s stock is a long-term winner with a solid near-term catalyst in Q3 earnings. 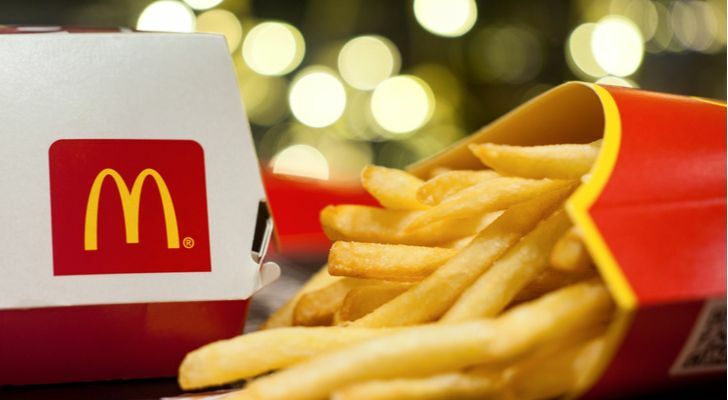 Article printed from InvestorPlace Media, https://investorplace.com/2018/10/mcdonalds-stock-buy-before-earnings/.